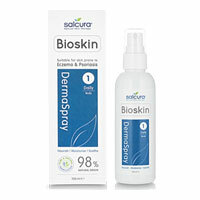 Bioskin Two Step Active Therapy System. 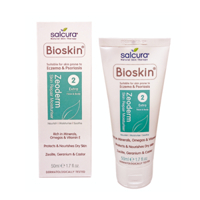 DermaSpray and DermaSerum can be used with Zeoderm to form a two-step system ideal for those prone to dry skin conditions such as eczema, psoriasis, dermatitis and urticaria. Using only naturally active ingredients, DermaSpray, DermaSerum and Zeoderm offer you a skin therapy regime that works with the skin to aid its own natural healing process. Suitable for adults and children from the age of 12 years and over. Steroids, SLS, parabens, lanolin, phthalates, antibiotics and paraffin. 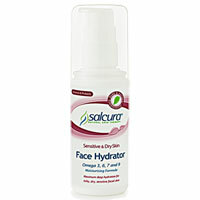 Salcura products contain only the finest grade pure and natural ingredients from around the world. They use no artificial chemicals or pharmaceutical preparations such as cortisones, peroxides, parabens and paraffin. 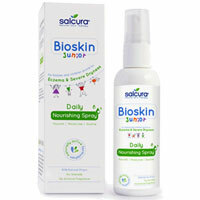 Ingredients are chosen for their bio-scientifically proven ability to deal with infection (eg. fungal or bacterial), inflammation and tissue damage.